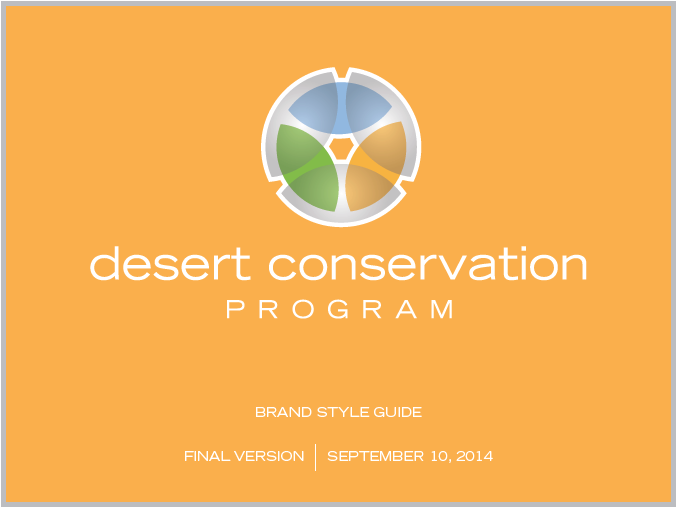 The Clark County Desert Conservation Program (CCDCP) had a logo that they loved. However, they only had one version of it. The logo didn’t meet the size or shape requirements for some of the uses they envisioned. The colors were beautiful and worked well for some uses, yet they required some grayscale versions or two-color versions for other types of projects. They requested that Zee Designs determine and create all the different versions of the logo that would meet the requirements of various vendors and uses, and develop a Brand Style Guide which would give the technical specifications for all versions of their logo. We would look at all the proposed uses of the logo and the different backgrounds against which it would have to display to advantage, and then create different versions of the logo for each type of application. The Brand Style guide would show each style and the technical specs for it, including Pantone colors. The guide is a wonderful example of what can be done with a single logo. All versions of the logo are immediately recognizable as CCDCP logos. All express the brand in appropriate ways for different situations and offer flexibility and choice of style.